Congratulations to Philly Blast 2018 and Episcopal Academy attacker, Ally Marino, on her verbal commitment to play lacrosse at Franklin & Marshall College! F&M is a private liberal arts college located in Lancaster, PA. As a member of the Centennial Conference, the “Diplomats” compete against Gettysburg, Haverford, Dickinson, Muhlenberg, McDaniel, Ursinus, Washington College, Swarthmore and Bryn Mawr. Last season (2016), the Diplomats reached a second-consecutive NCAA Final Four and tied the program records for wins in a season after posting a 21-3 record and a 9-0 mark in Centennial Conference action. 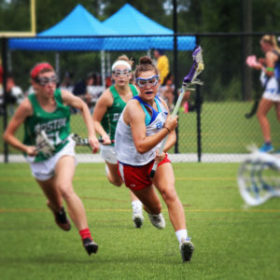 In addition to playing club lacrosse for Philly Blast (since Fall 2011), Ally also competes on the varsity lacrosse, varsity field hockey and varsity indoor track team. She also serves as a member of the Gallery Board and Model UN for The Episcopal Academy. Read Ally’s full commitment story HERE.